Description: New Old Stock (NOS) condition, vintage German military flyback chronograph from the1960's. Very rare in this condition. NOTES: Bundes Wehr means ‘Federal Defence’ in German. 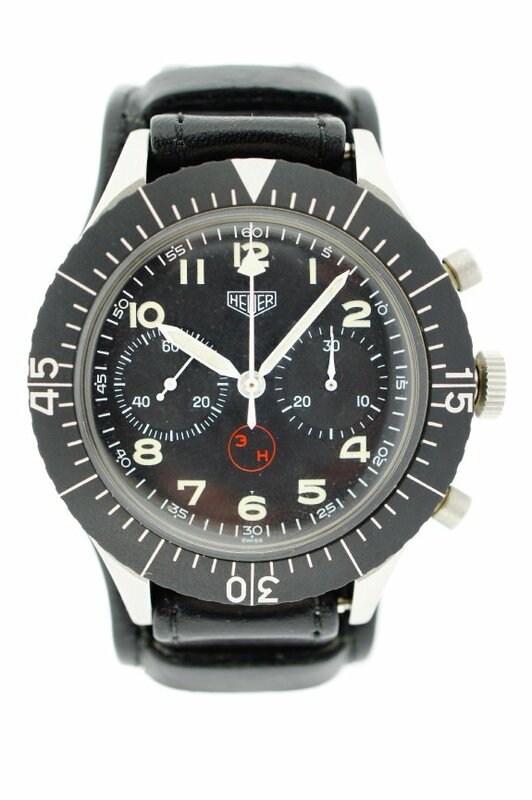 This military flyback chronograph, introduced by Heuer in 1968, is an iconic vintage wristwatch associated with the German military. This watch has the word “Bundeswehr” followed by the military serial number, indicating the region it was issued, engraved on the back as they were only issued to German servicemen from 1968 until the late 1970′s. The ‘3H’ red symbol found on the dial signifies ‘tritium’ as it is found in the luminous indexes and on the dial and hands. This symbol served to warn servicemen to avoid radioactive sensitive areas.